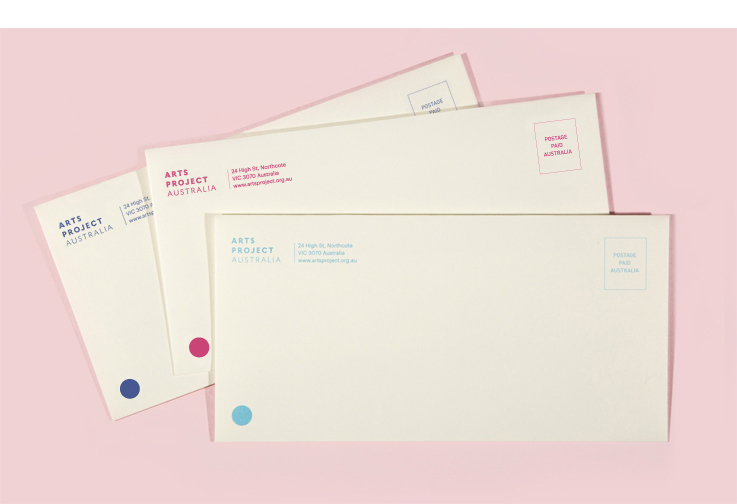 In celebration of their 40th anniversary, a total rebrand was completed for Arts Project Australia, a Northcote based commercial gallery and studio set up to foster artists with intellectual disabilities. Along a with a new identity, gallery collateral including invitations, brochures, e-communications and stationery were also revamped to reflect the individuality of the organisation's artists and staff. As part of the inaugural Community Partnerships Program with Yarra Trams, Arts Project artists Warren O’Brien and Cathy Staughton's work was transformed into a double sided Art Tram seen for 3 months throughout inner Melbourne suburbs. A series of Annual Reports have been design from 2014-17, each addressing a theme surrounding the work and artists of Arts Project Australia. In 2017, portraits of the artists in the APA studio were commissioned along with text written to illustrate the depth of commitment and success each artist has shown in their time with the gallery. To promote Arts Project Australia during the Melbourne Art Fair, a series of collectable posters were designed which included the gallery exhibition program for the forthcoming year. A standard format for gallery exhibition brochures was designed with now over 20 in the set. Each exhibition is individually branded but the style remains consistent to give the brochures a recognisable identity.